With over 1800 extra-solar planets discovered in the past 30 years, the search for life beyond our Solar System has begun anew. Astronomers believe that every star in the galaxy has a planet, and that one fifth of these might harbor life. The greatest challenge, though, is in being able to spot these “Earth-like” exoplanets. Due to the fact that they emit very little light compared to their parent stars (usually less than one-millionth the level of radiance), direct imaging is extremely rare and difficult. As such, astronomers rely predominantly on is what is known as Transit Detection – spotting the planet’s as they cross in front of the star’s disc. This too presents difficulties, because the transit method requires that part of the planet’s orbit intersect a line-of-sight between the host star and Earth. The probability that an exoplanet will be in a randomly oriented orbit that can allow for it be observed in front of its star is therefore somewhat small. Luckily, engineers and astronomers at NASA and other federal space agencies are considering the possibility of evening these odds with new technology and equipment. 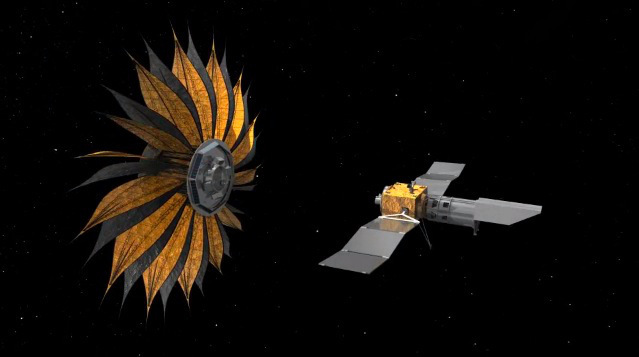 Once such effort comes from Princeton’s High Contrast Imaging Laboratory, where Jeremy Kasdin and his team are working on a revolutionary space-based observatory known as a “starshade” – a flower petal-shaped device that allows a telescope to photograph planets from 50,000 kilometers away. Essentially, the starshade blocks light from distant stars that ordinarily outshine their dim planets, making a clear view impossible. 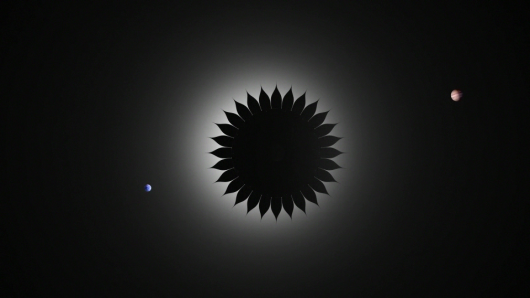 When paired with a space telescope, the starshade adds a new and powerful instrument to NASA’s cosmic detection toolkit. The flower-shaped petals are part of what makes the starshade so effective. The starshade is also unique in that, unlike most space-based instruments, it’s one part of a two-spacecraft observation system. The shape of the petals, when seen from far away, creates a softer edge that causes less bending of light waves. Less light bending means that the starshade shadow is very dark, so the telescope can take images of the planets without being overwhelmed by starlight… We can use a pre-existing space telescope to take the pictures. The starshade has thrusters that will allow it to move around in order to block the light from different stars. This process presents a number of engineering challenges that Shaklan and his team are working hard to unravel, from positioning the starshade precisely in space, to ensuring that it can be deployed accurately. 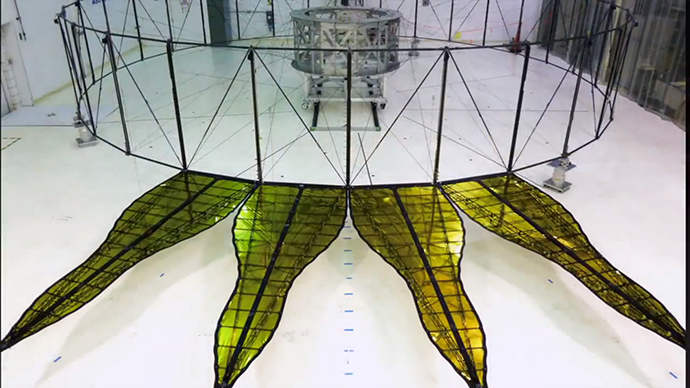 To address these, his research group will create a smaller scale starshade at Princeton to verify that the design blocks the light as predicted by the computer simulations. 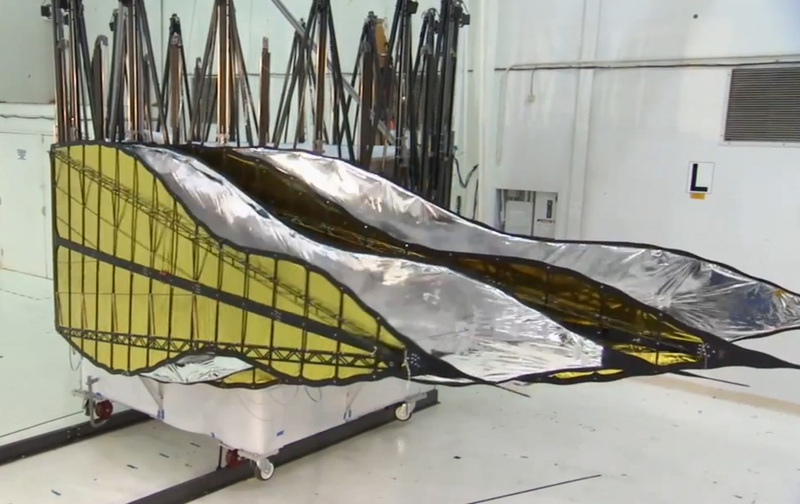 Concurrently, the JPL team will test the deployment of a near-full scale starshade system in the lab to measure its accuracy. Despite these challenges, the starshade approach could offer planet-hunters many advantages, thanks in no small part to its simplicity. Light from the star never reaches the telescope because it’s blocked by the starshade, which allows the telescope system to be simpler. Another advantage of the starshade approach is that it can be used with a multi-purpose space telescope designed to make observations that could be useful to astronomers working in fields other than exoplanets. As part of NASA’s New World’s Mission, the starshade engineers are optimistic that refining their technology could be the key to major exoplanet discoveries in the near future. And given that over 800 planets have been detected so far in 2014 – that’s almost half of the 1800 that have been detected in total – anything that can assist in their detection process at this point is likely to lead to an explosion in planetary discoveries.